Ga-day everyone and happy Friday!!! Yes it is a very happy Friday despite the rain here in the northeast. And why am I so happy you may ask? Well most of you are probably familiar with the gorgeous blog Savvy Southern Style of which Kim Nichols is the incredibly creative mind behind the blog. 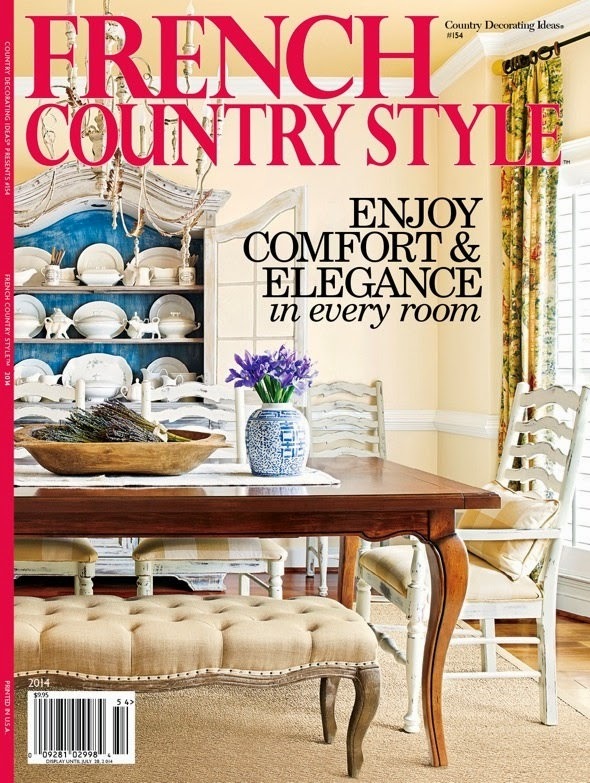 Kim has ah-mazing taste and style, so amazing that her dining room appeared on the cover of French Country Style last month. Simply to die for isn't it? OK okay...so why am I so excited??? Well you may or may not know that Kim has a special series she runs on Fridays in which she features rooms by different bloggers. It's called My Favorite Room, and guess who she is featuring today??? Yes that's right...It's MY favorite room!!! I was completely bowled over when about a month ago Kim contacted me asking if I'd like to share my favorite room in her wonderful series. So what room did I share? So grab a cup of coffee and hop on over to Savvy Southern Style for a peek at today's feature. Wishing you all a fabulous Friday and Wonderful weekend!!! Just found you from Kim's blog. Love this room and absolutely everything in it. Especially the desk find, no way for $15.00. I have to start shopping garage sales! I enjoyed seeing your room over at Savvy Southern Style. I was lucky to be featured there too. Nice to meet you! Come visit my blog if you have time. I am signing up to follow you through bloglovin! Met you over at Kim's blog this morning. Beautiful master bedroom. You inspired me to remove the hutch above my dresser and set the dresser in front of our window. I too have the month botanical pictures hanging in our dining room in gold frames. And your hardware on your bedroom set matches ours. Oh aren't you sweet!! Thanks and have a super weekend Going into DC this morning then onto junking. Saw your bedroom on SavySouthernStyle....it is beautiful! You did an amazing job....what I noticed right away was your ceiling! I thought it was wallpaper! that is astounding!! I love it! What stencil did you use?? What a beautiful and serene bedroom. Love it all. Can't believe you stenciled that ceiling! I'm sure that was a major effort but it is gorgeous! Enjoyed seeing your master bedroom. Just hopped over from Kim's and I know I am going to spend Friday night reading all of your entries! If you wouldn't mind sharing, where did you get the beautiful bed cover for your bed featured on Kim's blog? I would love to have it for my bedroom.....right size, right color and right thickness! Thank you so much! I purchased the quilt at Home Goods for only $39 for a queen...a steal! Was just there yesterday and they still have some in the store near me. Hopefully if you have a HG near you they may have some in stock! Congrats, your bedroom is amazing! I love the ceiling, so clever and totally unique. A gorgeous room! 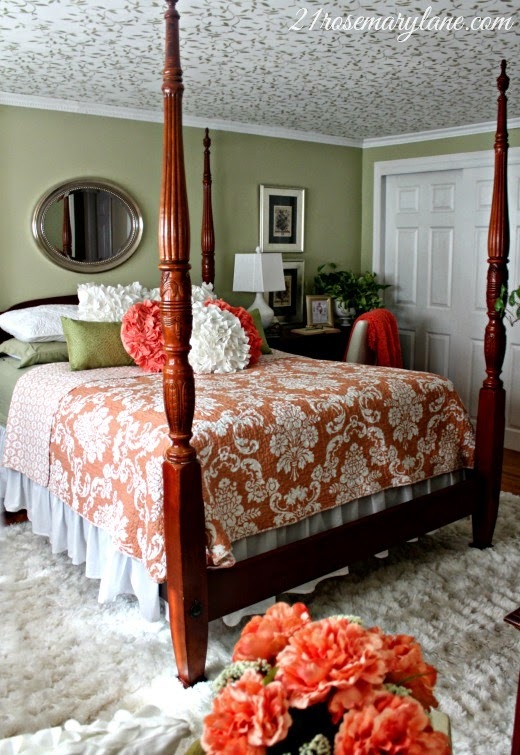 Good choice to use your master bedroom....it is certainly gorgeous!